The horse has evolved over the past 45 to 55 million years from a small multi-toed creature, Eohippus, into the large animal of today. Humans began domesticating horses around 4,000 BC. While the horse evolved in the Americas, it became extinct between 8,000-12,000 years ago; reestablished on the continent when the Spanish arrived on the American mainland in the 16th century. There are more than 300 breeds of horses, with a wide variety of uses. With 6,000 years of history, the connection between horses and humans is a powerful relationship. 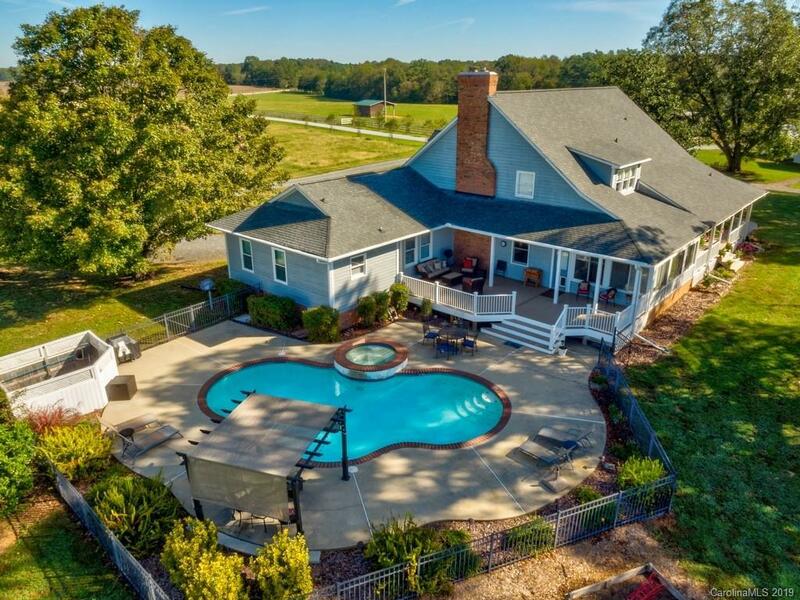 Your search for the ideal location for your personal horses or your horse business can be found at 4404 Nesbit Road in Monroe, NC; a 51+ acre equestrian estate with a 4,540 sf home and complete equestrian facilities. The current owners are exceptional stewards of the property and have made extensive renovations/upgrades to create this extraordinary farm. Located in the beautiful Union county countryside this 3-bedroom home features wood beams, stone accents and hardwood floors. You are greeted with a circular drive and rocking chair front porch. The main level offers a large, open great room with stone fireplace, adjacent to the dining room, each with exposed wood beams. A sun room opens to the great room and leads to an epicurean kitchen with breakfast space. Completing the main floor living space is a private 2-bedroom guest wing with bathroom and access to the pool area. The master suite occupies the entire second level and redefines the master suite concept. Renovated in 2018, the oversized bedroom (26’4” x 23’6”) includes a large stone fireplace, spacious sitting area and office nook. A four-star master bath includes 2 vanities with vessel sinks and a large tile walk-in frameless shower. Completing the bath are four (4) individual walk-in closets with shelving. The home is designed for indoor-outdoor living with a large partially covered deck flowing onto the pool patio surrounding a fresh water pool with built-in hot tub. This space is accessible from the sunroom and the guest suite. Clearly, this home combines warmth, efficiency and style; but it is just part of the package. As you dive into the farm down the tree-lined drive, it is obvious this is a place to continue our long, historical relationship with horses. It has all the features necessary for a boarding and training facility. Large fenced pastures and a lighted arena welcome you as you approach the barn area. The well-designed barn has large stalls with mats and fans, feed room, tack room, wash stall, shop and equipment storage, lounge and office. Recent upgrades include 35 new skylights to brighten the barn, 7,000 linear feet of new fencing and new run-in sheds. Additionally, the lounge and office were remodeled. There is a round pen in place and ample parking for boarders and horse trailers. So much planning, so many improvements and exceptional ongoing care and attention to detail necessitates a personal tour to truly appreciate this farm. It is then you are stuck with the realization that here you and your horses have found a home. 4404 Nesbit Road, Monroe, NC; another point of connection between humans and horses.